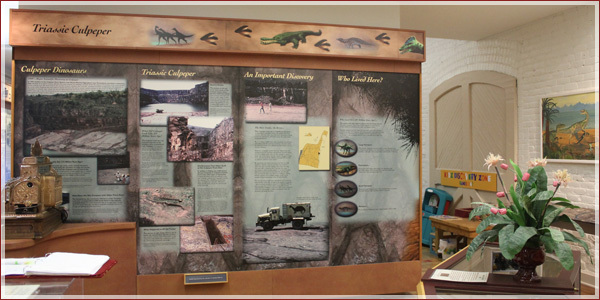 The Triassic Gallery highlights the age of dinosaurs in this region. More than 215 million years ago dinosaurs roamed the region we now call the Virginia Piedmont. In 1989, evidence of the existence of these great beasts was unearthed at Culpeper Stone Company, a quarry near the town of Culpeper. What was discovered was, at the time, the largest concentration of dinosaur tracks on Earth. Nearly 5,000 tracks, most from the “Anchisauripus Parallellus,” a four-legged carnivore (and an ancestor of the infamous raptor), have been unearthed in Culpeper! The Museum is fortunate to have one set of these tracks, which are featured as a hands-on component in The Triassic Gallery! 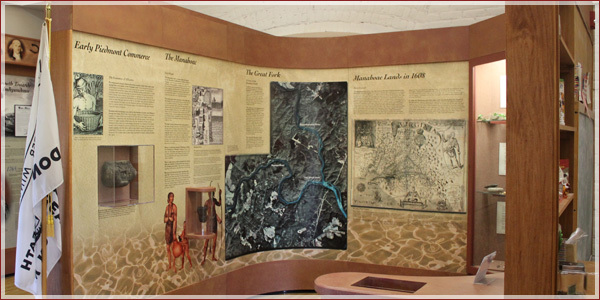 The Native American Gallery highlights the Manahoac Confederation. Archaeologists, farmers, and metal detectors have found evidence of Native Americans in the Culpeper region, and there are still descendants of the Manahoac people here in Virginia. This confederation of tribes stayed in the Piedmont where they hunted, fished, and created tight-knit communities near Culpeper. Before the age of European settlement, the Manahoacs had left the area to follow the herds of bison west over the Blue Ridge Mountains. The Museum has wonderful examples of their stone tools, weapons and projectile points, and even a lovely chain ornamentation made from deer bone. The Colonial Gallery highlights the fight for American independence. With the founding of English and German settlements along the eastern slopes of the Blue Ridge Mountains men and women came in search of rich soil, religious freedom and separation from their sovereign. The Colonial Gallery explores this eventual fight for freedom. Emphasis is placed on the establishment of the Culpeper Minutemen, and their adventures as they guarded the Elizabeth River in the Tidewater in 1776. Some of the Museum’s impressive collection of Colonial documents is often on view. 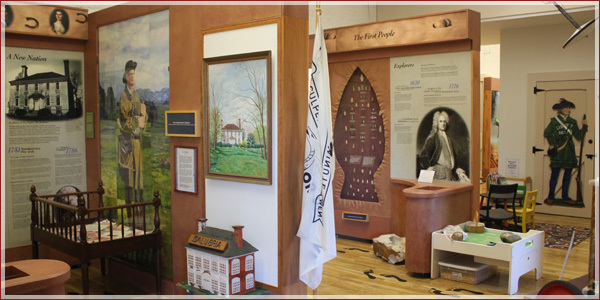 The Civil War Gallery is dedicated to the history of America’s most bitter and controversial war. This war pitted brother against brother, father against son, and family against family when the South succeeded from the Union and the North fought to preserve the Union. 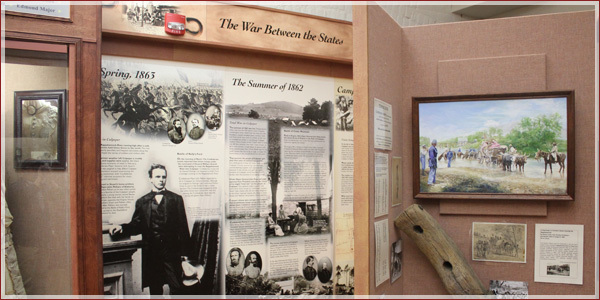 This bloody conflict, as well as the lead-up and Reconstruction era afterwards, is interpreted through graphic panels, artifacts, and a large-scale model of the county with audio narratives of featured battles. Meet the men, women, and children, who lived, fought, gained their freedom, and survived this war between the States. Culpeper regained its position as a vibrant town within two decades of the end of the Civil War in 1865. 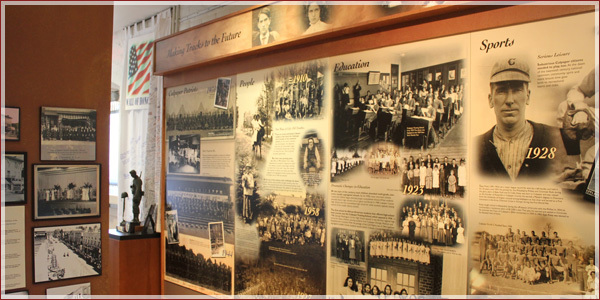 Small industry, agri-business, commerce, and a solid group of strong-willed residents transformed Culpeper and the twentieth century dawned with a promise of prosperity. Graphic panels covered in photos, illustrations, maps, letters, and other graphics depict the modern growth of Culpeper in the 1900s. The Museum regularly changes its exhibit cases several times each year so there is always something new for you to see and learn about!